The pattern below has been retired and no longer will receive pattern support if needed. Please use the revised pattern that comes with a video tutorial. Read me ~> Work in continuous rounds, do not join. I used Red Heart Super Saver yarn with a 3.75 mm hook. 6) CH1 and turn, 1sc in the next 4st, CH1 and turn, 2tog twice. Finish off. Optional* Once you have the boot sewn together, shape the hollow part with your fingers until you are happy with the shape and put in a stitch or 2 to hold that shape together. Chain a length that will fit around the top of the boot. 1sc in each, finish off and sew to boot. *switch to skin color on the last st.
3+) this is where you go on and make fingers. Might be easier to switch to a smaller hook and make the fingers. Any length you choose. If not: 1sc then 2tog until you close the gap. Add a thumb if you want to! To attach the arms thread yard through the inside part of the upper arm as pictured below then continue that thread though the body and on through the inside of the other arm pull it tight and knot off, doing them this way gives you jointed arms! Yahooo!! You're almost finished, now for the fun part... my favorite part of making dolls. Adding hair and creating a face that gives the doll it's personality! Now I like to root the hair into my dolls. Coraline has a part to the side of her head so to make this style look it's best I rooted most of it and then lay the rest over the head and sewed it in place as pictured below. Once you have all the yarn you want on the head and you've styled it the way you want it and sewed some of it down there will still be some areas that you'll find as pictured. Ok, so for the eyes and mouth, nose and so on, it is all up to the creator. I chose buttons because they look great I think! I glued these in place also. The nose is created by inserting a length of yarn through the back of the head and out through where the nose will be. Use a needle and crochet hook to build and shape the nose. Once you've finished run the tail of the yarn back out through the back of the head and knot off. Hide in the hair. The same goes for the eyebrows and the mouth. The dragonfly hair clip I made with pipe cleaners and glued in place. Oh, almost forgot... the button key necklace I made simply by taking a key charm and gluing a button on it! SO cute!! 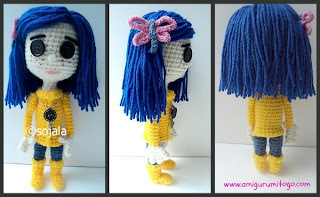 So now we're finished and you have your own Coraline doll! Hi! Nice blog. Thank you for the pattern. I got to get to work on making the doll! My sister won't stop bugging me to make her one! Your dolls are great, and thank you so much for your generosity in sharing them :-) I love to crochet dolls and share the pattern as well; it is ALWAYS a pleasure to meet a kindred spirit. What a great pattern and so nice of you to share! I'm also a great believer of sharing free patterns. Love them!! I have no words! Thanks again, have a super day!! I love the doll! I love the hands, face, everything about it. I have to say your technique for the hair interests me greatly. I make dolls and I have yet to make one with a "head of hair" like your Coraline doll. The way you did it looks simple enough. I'm planning to make an Alice in Wonderland doll. I'm wondering, do you think the rooting technique would work best for her as well? I'm also wondering, how many rows did you do? I can see from the picture the one row before you sew on the top part of her hair, but what about under that row? If you could answer any of these questions it would be greatly appreciated. Hello Devious One! I usually do 3 or 4 rows and skip a row in between. I think this technique would be perfect for Alice, the only thing is because the top cap isn't rooted you'd really have to sew it in place quite well to ensure none slips out. You could also run a hot bead of glue down each side of the part on the very top and that would hold it securely too. Thank you so very much for sharing this amazing creation of yours and giving me a way to improve his Christmas this year :) I'm sure requests will be made for Wybie and Wuss Puss after he opens this gift! Good luck with your doll and wishing you and your family a wonderful Christmas!! I don't crochet, this is amazingly adorable. I'm now searching for someone to make this for me. You're welcome Ploduska!! I just seen your Coraline doll and she's gorgeous!! Love her so much and would love it if you posted pictures of her on my facebook page! My fb is Amigurumi Freely and the link is on the top left side of this page. WOW! Awesome! I have to crochet this! She's my favorite character! Thank you so much for the pattern! I absolutely adore your Coraline! At times, it's a toss up between Coraline and The Other Mother when it comes to my favorite character from the book. I haven't seen the movie. I'm currently working on a Coraline of my own. Ok... a Coraline for my daughter. I wanted to modify my a bit, but since the first one is my daughter, the only thing I've changed is the hair color, and the outfit. It's gold. 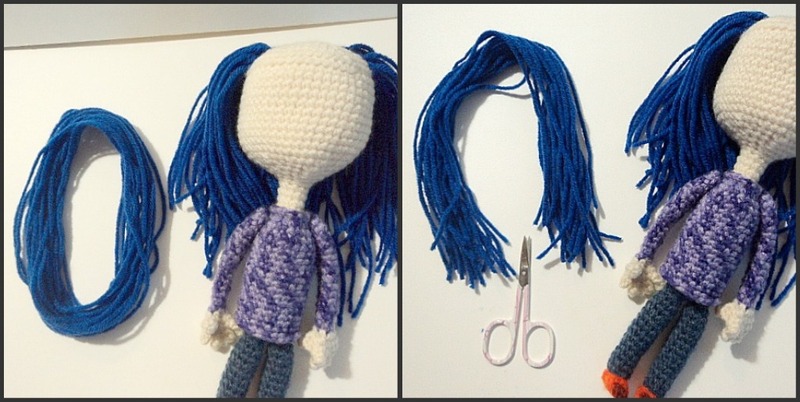 Besides those two things, my daughter wanted her Coraline to be "just like yours!" How wonderful to read your message today Opal! I appreciate it very much. I never heard of Coraline until I watched the movie, and of course I became a huge fan. I have the audio book now and I am looking for a good illustrated copy of the book but so far no luck. I'm not sure there are any. I look forward to seeing your doll once she fully emerges into the world! I can't thank you enough. Really. awww, that great RoseLily, so glad you found the pattern! I love Coraline and have seen the movie many times over. 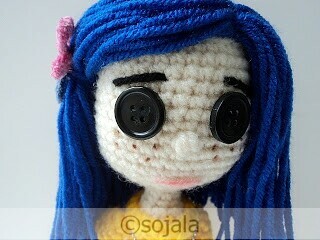 I enjoy your crochet along and one day I will complete my Coraline. I appreciate the time and effort you put into making your videos. Thanks! such an awesome message! Thank you, I appreciate that! I've seen Coraline many times as well... it never gets old! I want to one day make more of the characters, when time allows me too that is! FROM; Mrs. Sandy, in Georgia. The doll is 10 inches tall but that will vary depending on your stitch tension and hook size. I used a 3.7m mm hook and my crochet stitches are fairly tight. I DON'T KNOW WHAT SELECT PROFILE IS ALL ABOUT, OR WHAT TO PUT INTO THE URL. SO I PICKED ANONYMOUS. SORRY IF THAT IS A PROBLEM. can i translate your free patters to dutch and put them on my free website? Love your doll! My daughter wants me to make her a Coraline doll. I made my legs indepedent from the body. I'm confused about how to attach them. Did I miss something? Thank you so much for the pattern! I thought that might be the method, but I'm new at this so thought I better be sure. Thank you so much! He is also a mini version. Really?! That's surprising to me. Maybe next week I'll get it finished. 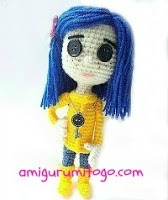 Hi, I have finished Wybie and also shared on Amigurumi Freely! Thanks for sharing your patterns ! That's awesome! Thank you so much for sharing your great works! I am looking forward to your more creative works! Thank you for sharing your pattern, This doll is so cute! Coraline has always been may favorite. i am new to the whole crochet thing, and i found this and thought it was amazing. i wanted to ask what kind of yarn do you use to make this? i would like to try my hand at it but i don't want to buy the wrong kind. Hello, welcome to crochet! It's exciting, I hope you enjoy it and go on to make many wonderful things. I use Red Heart worsted weight acrylic medium #4 and I used a 3.75 mm hook but a 3.5 or 4mm would work just as well. Keep me posted on how everything goes for you! 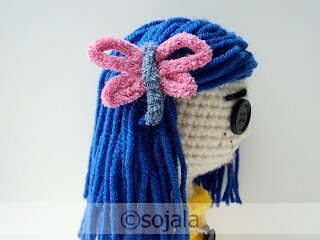 wanna crochet the dragonfly clip !